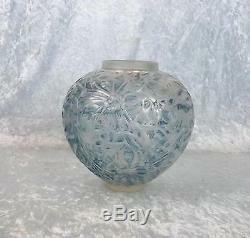 Lalique Gui Opalescent Glass Vase With Blue Staining No. A beautiful opalescent, blue stained Gui vase by Rene Lalique. The vase is of footed ovoid form with a shallow neck. It has moulded decoration of mistletoe and has blue staining to highlight this decoration. The vase is etched to the base R. The pattern number is 948 and this was produced circa 1930. Dimensions The vase has a diameter of 6 ¾ inches (17cm) and a height of 6 ¾ inches (17cm). Condition Some of the staining is a little worn in parts but overall the piece is in great condition with no chips or cracks. Please see further images below for condition.. The item "Lalique Gui Opalescent Glass Vase With Blue Staining No. 948 C1930" is in sale since Saturday, February 06, 2016. This item is in the category "Pottery, Porcelain & Glass\Glass\Art Glass\French\Lalique".